NEW YORK--(BUSINESS WIRE)--Nickelodeon, at its annual upfront presentation held today at Alice Tully Hall in New York City’s Lincoln Center, detailed the plans powering its expanding reach and growing footprint as it heads into the season with more than 650 episodes of new and returning series. Through fostering close relationships with its audience, partners and the creative community, Nick has kept its content pipeline full in every genre, on every screen and in every territory–all contributing to owning the top shows year to date for Kids 2-11 and preschoolers; a significant increase in share; and the number-one position year to date with Kids 2-11 and preschoolers, a standing it had for all of 2015, as well. “We have worked hard to deepen our relationships with our audience, our partners and the creative community to keep our momentum growing, and we remain unwavering in our mission to put kids first and devote every resource to making the world a more playful place,” said Cyma Zarghami, President, Viacom Kids and Family Group. During today’s presentation, Nickelodeon detailed an expanded product offering for its award-winning partner marketing division, Nickelodeon Velocity (formerly Nickelodeon Inside Out Solutions). Nickelodeon Velocity utilizes Nick’s creative leadership and iconic intellectual properties to connect partners to kids and families across the brand’s ecosystem of multi-platform media destinations, an expansive social footprint, consumer products and on-the-ground experiences. Nickelodeon Velocity can now also offer marketers unprecedented access to the Viacom Velocity Product Group, which is powered by an industry-leading suite of data analysis and social amplification tools. Nickelodeon Velocity’s campaigns are designed to put privacy first, are age-appropriate and meet applicable legal requirements. Also, Carolina Panthers quarterback Cam Newton took the stage to detail his new series, All In with Cam Newton, where he works with real kids to help make their dreams come true. Rob Dyrdek made a special appearance to talk about two new series he is producing for Nick: Crashletes, a viral sports clip series hosted by New England Patriots’ Rob Gronkowski; and Jagger Eaton’s Mega Life (working title), a docu-series that follows the 15-year-old skateboarding phenom as he skates around the world and hangs out with his idols. Rusty Rivets, picked up for 26 episodes, follows the animated adventures of Rusty as he invents his way out of jams by repurposing parts and objects into the wildest, coolest contraptions ever. The series embodies the principles of the maker movement, while exposing preschoolers to concepts found in science, technology and engineering. Rusty Rivets is created and co-produced by Spin Master Entertainment (PAW Patrol), and slated to premiere later this year. Sunny Day, picked up for 40 episodes, follows Sunny, the best hairstylist in her town and a natural leader who believes that every problem can be solved with determination and a little creativity. Created and produced by Silvergate Media (Peter Rabbit), Sunny Day features themes that teach preschoolers about community involvement and self-confidence. Nick will also air new episodes of returning hit preschool series Shimmer and Shine, Blaze and the Monster Machines, Mutt & Stuff, PAW Patrol, Wallykazam! and Dora and Friends: Into the City! Nickelodeon, the number-one network for Kids 2-11 year to date, currently owns the top animated series on all TV. Today, the net announced the renewals of animated hit series: SpongeBob SquarePants, for seasons 10 and 11; and the second season pickups of Harvey Beaks and Pig Goat Banana Cricket. The Loud House, picked up for 26 episodes, is the first series to be greenlit out of Nickelodeon’s Animated Shorts Program and is inspired by first-time creator Chris Savino’s (Rocko’s Modern Life, The Powerpuff Girls) chaotic life growing up in a huge household. Bunsen is a Beast!, picked up for 20 episodes, is an original animated comedy created and executive produced by animation veteran Butch Hartman (The Fairly OddParents). The series follows the adventures of Bunsen, the first beast to attend a human grade school, and his best friend and classmate Mikey, who guides Bunsen through the ups and downs of life as a human. Mysticons, picked up for 40 episodes, is a half-hour, action series about four girls who transform into legendary warriors and band together to save their realm from an evil queen, Necrafa. Mysticons is licensed by Nelvana. Welcome to the Wayne, picked up for 20 episodes, marks Nick’s first digital short-form series to be greenlit for television. The series follows the comedic adventures of two 10-year-old boys exploring the crazy, unpredictable world of their New York City apartment building The Wayne. Welcome to the Wayne is created and written by Emmy Award-winning writer and composer Billy Lopez (The Wonder Pets!, Phineas and Ferb). 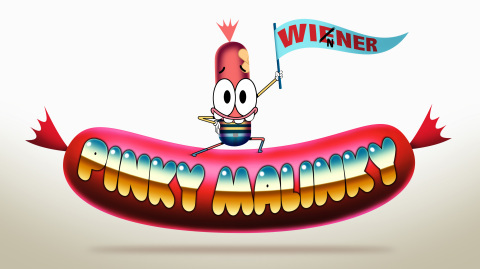 Pinky Malinky, picked up for 20 episodes, is a mockumentary series following the everyday life of Pinky Malinky, an infectiously positive hot dog living in a human world. Pinky’s experiences will be shared across social media and Nick’s digital platforms. The series is co-created and co-executive produced by Chris Garbutt and Rikke Asbjoern (The Amazing World of Gumball), and executive produced by Scott Kreamer (Kung Fu Panda: Legends of Awesomeness). Nick will also air new episodes of returning animated series Teenage Mutant Ninja Turtles, The Fairly OddParents and ALVINNN!!! and The Chipmunks. Nickelodeon currently owns the top live-action series with Kids 2-11 on all TV, led by Game Shakers. The net announced today the renewal of the two series from hitmaker Dan Schneider: Henry Danger, for season three; and Game Shakers, for season two. Additionally, Nick has picked up another live-action hit The Thundermans for season four. Jagger Eaton's Mega Life (working title), picked up for 20 episodes, is an action-packed docu-series that follows 15-year-old skateboarder Jagger Eaton as he skates the world and hangs out with his inspiring idols. Jagger Eaton's Mega Life, executive produced by Rob Dyrdek and Shane Nickerson of Superjacket Productions (Fantasy Factory, Ridiculousness), will begin production this spring. New England Patriots Super Bowl XLIX Champion and Pro Bowl tight end Rob Gronkowski will host the previously announced Crashletes, a 20-episode viral sports clip series featuring guest personalities from the worlds of sports and entertainment, along with the funniest, craziest clips and user-generated content. The series is executive produced by Rob Dyrdek and Shane Nickerson of Superjacket Productions. Ride, picked up for 20 episodes, follows the adventures of Katherine “Kit” Bridges who relocates to England with her dad who is joining the faculty at Covington Academy, an elite equestrian boarding school. Shot in Canada and Ireland, Ride will be produced by Canada’s Breakthrough Entertainment and Buccaneer Media in the United Kingdom. The Other Kingdom, picked up for 20 episodes, follows fairy Princess Astral who takes human form and enters the mortal world for 90 days. The series is created and executive produced by Thomas W. Lynch and produced by DHX Media. Steven DeNure and Anne Loi of DHX Media also serve as executive producers. 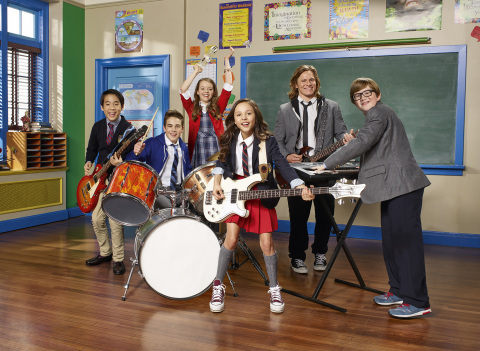 School of Rock, picked up for 12 episodes and produced with Paramount Television, follows a group of rule-abiding students who learn to take risks and reach new heights thanks to their substitute teacher, a down-on-his-luck musician who uses the language of rock ‘n’ roll to inspire his class to form a secret band. School of Rock is developed by Jim and Steve Armogida (Crash & Bernstein, Grounded for Life), who also serve as executive producers with Jay Kogen (The Simpsons, Henry Danger). The 2003 movie of the same name was written by Mike White. Its director Richard Linklater and producer Scott Rudin serve as series executive producers, along with Eli Bush (The Newsroom, Ex Machina). 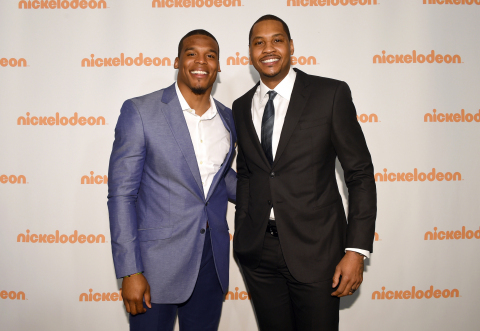 All In with Cam Newton (formerly announced as working title I Wanna Be), picked up for 20 episodes and hosted by Carolina Panthers quarterback and 2016 NFL MVP Cam Newton, takes real kids on the ride of their lives to help make their dreams come true. All In with Cam Newton is produced by Magical Elves with Dan Cutforth, Jane Lipsitz and Newton serving as executive producers. The Dudas (working title, formerly announced as Homeroom), picked up for six episodes, follows brothers Sam and Tyler Duda–polar opposites whose worlds are turned upside down after Sam skips a grade and joins his brother in 7th grade homeroom. The show is created and executive produced by Kevin Jakubowski. Sharla Sumpter Bridgett also serves as an executive producer. The Ludwigs follows the adventures of five foster children who are on a quest to find out what happened to their foster parents after they mysteriously disappear. Filled with comedy, mystery and adventure, the kids must keep up appearances that everything’s fine at home and fend off the Ludwigs’ greedy and duplicitous heirs. This new project will yield two new series: an English-language, globally commissioned production titled The Ludwigs (20 episodes); and De Ludwigs (20 episodes), a Dutch-language production commissioned by Nickelodeon Netherlands. Both series are produced by Blooming Media and are filmed in Amsterdam. I Am Frankie (working title), picked up for 20 episodes, follows the comedic and dramatic adventures of teenager Frankie who has a very big secret–she’s actually an experimental android who must hide her true identity or risk being powered down forever. I Am Frankie is produced in partnership with Nickelodeon Latin America and will be shot in the new Viacom International Studios in Miami, Fla.
Nickelodeon will also air new episodes of returning live-action series Bella and the Bulldogs and Nicky, Ricky, Dicky & Dawn. Lost in the West is a three-part original TV movie that follows two teenage stepbrothers, Chip and Dave, who get transported back in time to 1885 after one of them accidentally invents a time machine. They soon become entangled in a crazy Wild West adventure as they fight off evil outlaws, avoid changing the future and try to make it back to the present. Lost in the West is produced by Galdo Media and directed by Carlos Gonzalez (Big Time Rush). Albert, Nickelodeon’s first original animated TV movie, is the sweet story of a tiny Douglas fir tree named Albert who loves Christmas more than anyone, but whose miniature size has kept him inside the plant nursery year after year. Joined by his two best friends, a fun-loving palm tree and a rambunctious weed, Albert treks across the country to live his dream of becoming the world’s most famous Christmas tree. Max Lang (The Gruffalo) is set to direct, with Chris Viscardi and Will McRobb (The Adventures of Pete & Pete) executive producing. Hey Arnold!, a two-part animated TV movie written and executive produced by the series’ original creator Craig Bartlett, will pick up where the original series ended and resolve unanswered questions and plotlines, including Arnold finally getting answers about the whereabouts of his missing parents. Legends of the Hidden Temple is a new action-adventure movie drawing from the iconic game show’s premise of kids competing to retrieve artifacts from a mysterious Mayan temple. The new TV movie version will follow three siblings who find themselves immersed in a real-life mission that they must complete in order to escape alive. Legends of the Hidden Temple is executive produced by Scott McAboy and Jessica Rhoades, and produced by Amy Sydorick. The TV movie is directed by Joe Menendez (From Dusk Till Dawn: The Series) and written by Jonny Umansky & Zach Hyatt, and Alex Reid. Nickelodeon, now in its 36th year, is the number-one entertainment brand for kids. It has built a diverse, global business by putting kids first in everything it does. The company includes television programming and production in the United States and around the world, plus consumer products, online, recreation, books and feature films. Nickelodeon’s U.S. television network is seen in more than 90 million households and has been the number-one-rated basic cable network for 20 consecutive years. For more information or artwork, visit http://www.nickpress.com. Nickelodeon and all related titles, characters and logos are trademarks of Viacom Inc. (NASDAQ: VIA, VIAB).